The feature was very well-received and actually got a lot of national press, including a Very Innovative Product accolade from Good Housekeeping magazine. The only concern for some consumers, however, is that it’s only available on the top-of-the-line Touring Elite trim of the vehicle, keeping customers on lower budgets from affording the feature. According to Edmunds, Honda reportedly is considering fitting the HondaVAC into more Odyssey models, perhaps as a stand-alone add-on, but only if it can be done in a cost-effective way for the automaker. Considering vehicles with the HondaVAC require special paneling and wiring, that could ultimately prove a little challenging. Still, the automaker clearly wants to offer this feature to more drivers, and as your Honda dealership we can say that we are 100% in favor of that game plan. 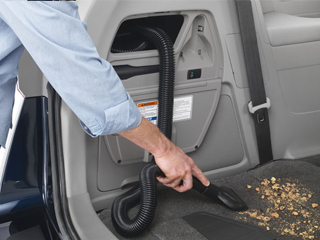 While we wait, however, the 2016 Honda Odyssey is available for purchase now for those that do want the vacuum cleaner, and for those that can’t quite afford it, it’s not like the Odyssey isn’t an elite minivan otherwise. The HondaVAC is something that just adds to its massive popularity and critical acclaim. amazing model of Honda Cars. Honda's mostly models are so amazing. I am Honda dealers in thane provide many latest model. I really like your post indeed you explained your post very well so keep it up for more post.